This section contains information on NHC forecast errors over the years. The verifications below are based on the NHC best track database as of 9 April 2018, and, except as noted, follow the verification procedures given in Section 2. All verifications in this section include subtropical systems, and are homogeneous with the best track CLIPER5 and Decay-SHIFOR5 models. 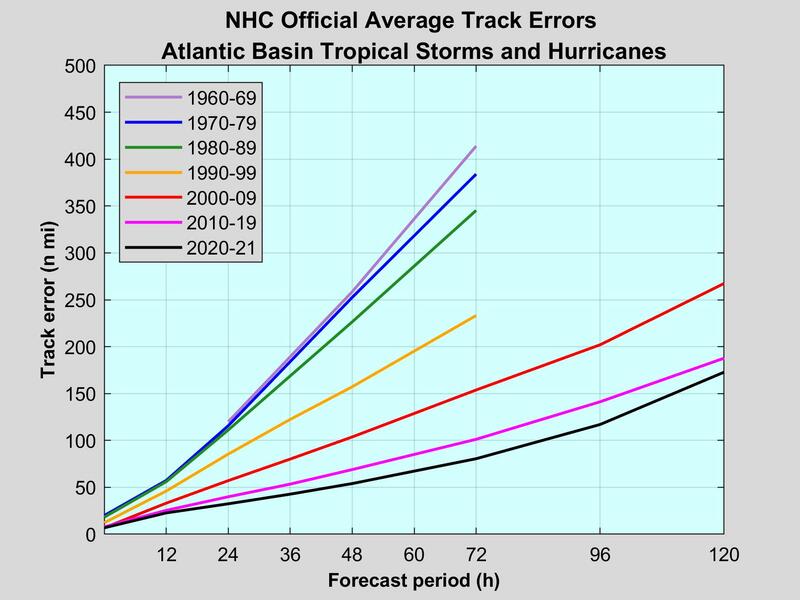 Because forecasts for non-developing depressions are not available in digital form prior to 1989, verifications that include years before 1989 are given for tropical storms and hurricanes only. 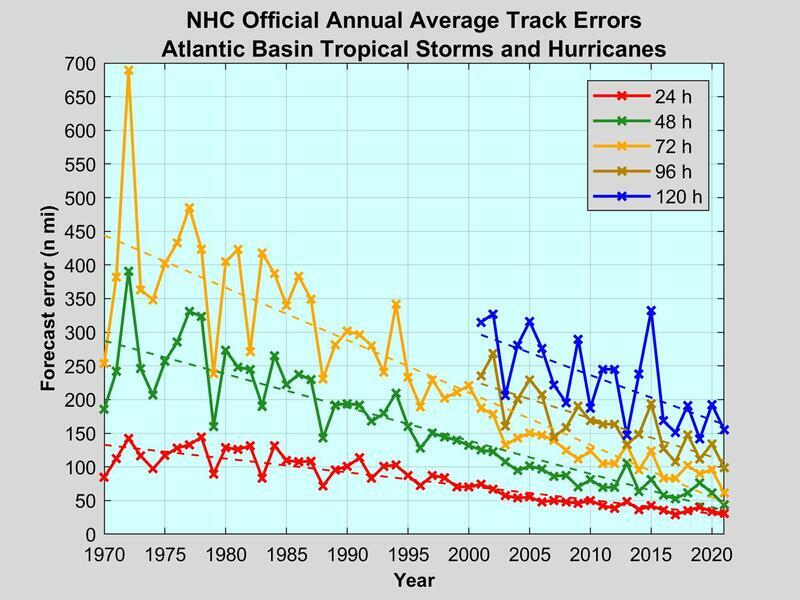 Annual average official track errors for Atlantic basin tropical storms and hurricanes for the period 1970-2017, with least-squares trend lines superimposed. 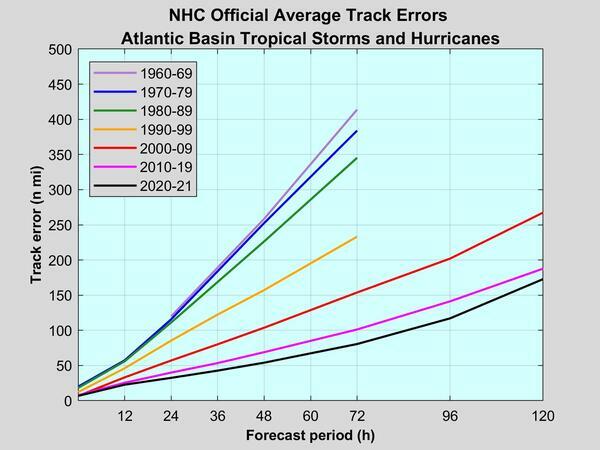 Official track errors for Atlantic basin tropical storms and hurricanes by decade. 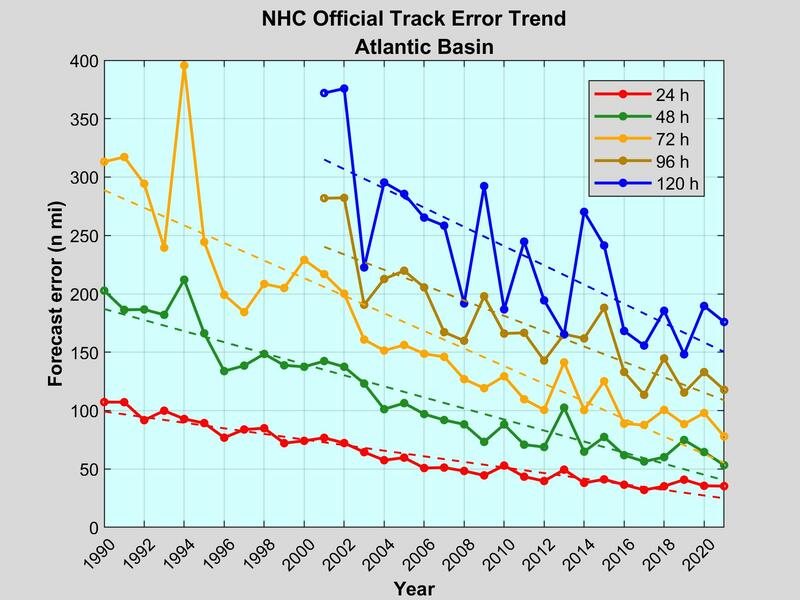 Annual average official track errors for Atlantic basin tropical cyclones for the period 1989-2017, with least-squares trend lines superimposed. 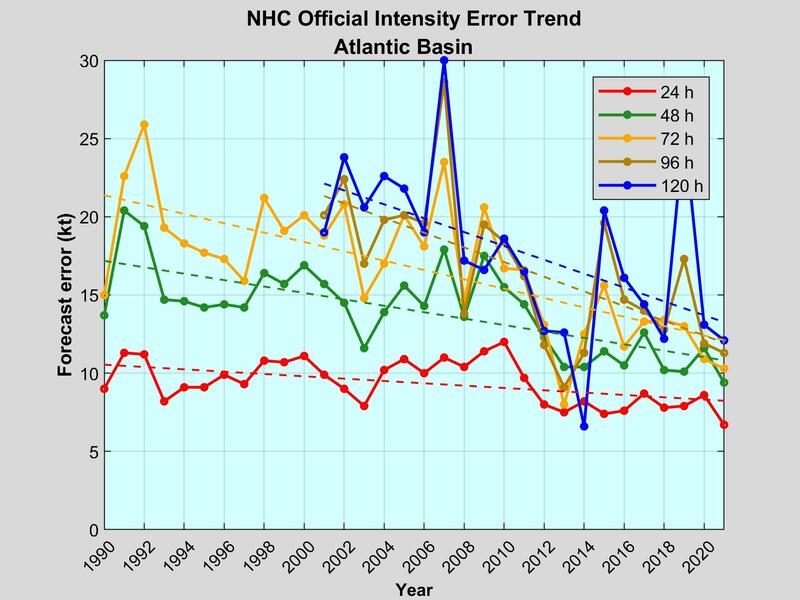 Annual average official intensity errors for Atlantic basin tropical cyclones for the period 1990-2017, with least-squares trend lines superimposed. 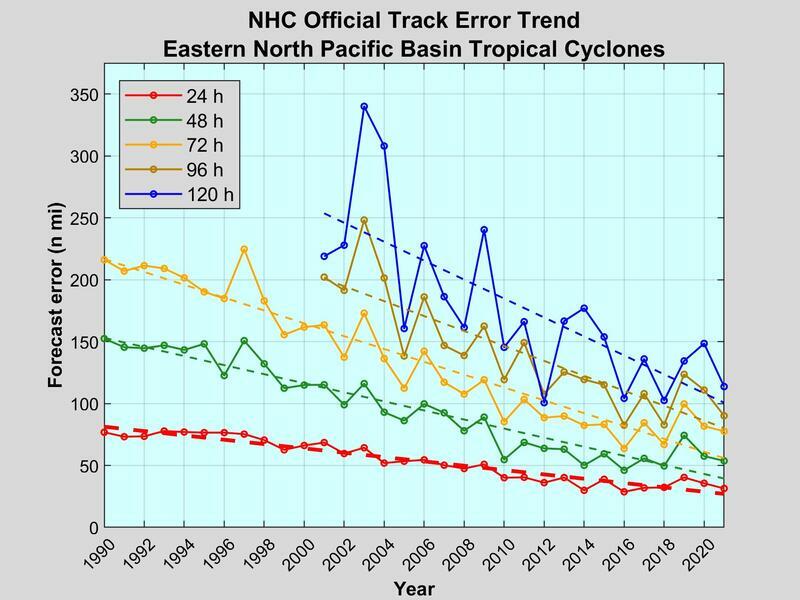 Annual average official track errors for eastern North Pacific basin tropical cyclones for the period 1989-2017, with least-squares trend lines superimposed. 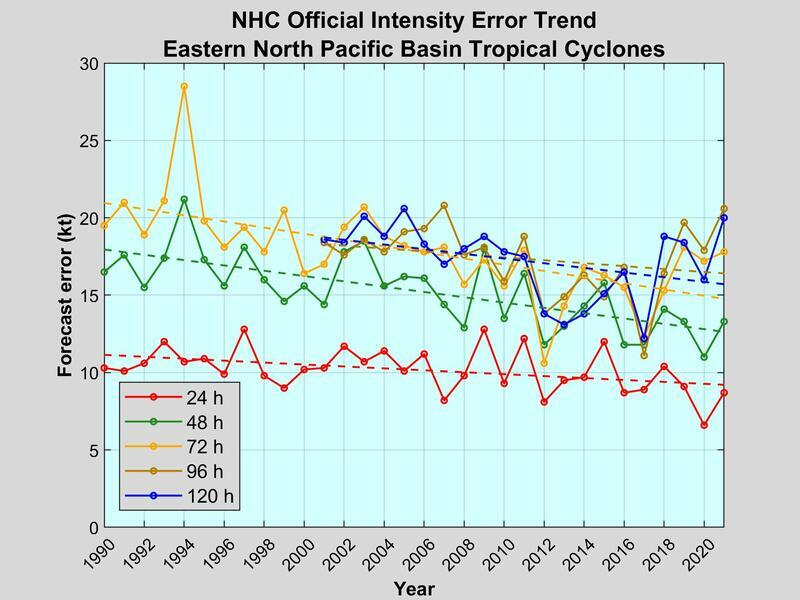 Annual average official intensity errors for eastern North Pacific basin tropical cyclones for the period 1990-2017, with least-squares trend lines superimposed.